On a recent road trip to spend a couple of days in Laguna Beach, Bake and I stopped in Newport Beach for a late lunch at True Food Kitchen in Fashion Island. In the past, we have enjoyed the area, staying at the Balboa Bay Beach Club with its beautiful views of the marina and comfortable surroundings. 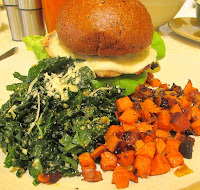 Because of the many recommendations from family and friends, on this day it was about True Food Kitchen, a restaurant based on the concept of Dr. Andrew Weil. Its goal is to use local and organic products whenever possible and maintain a green environment. 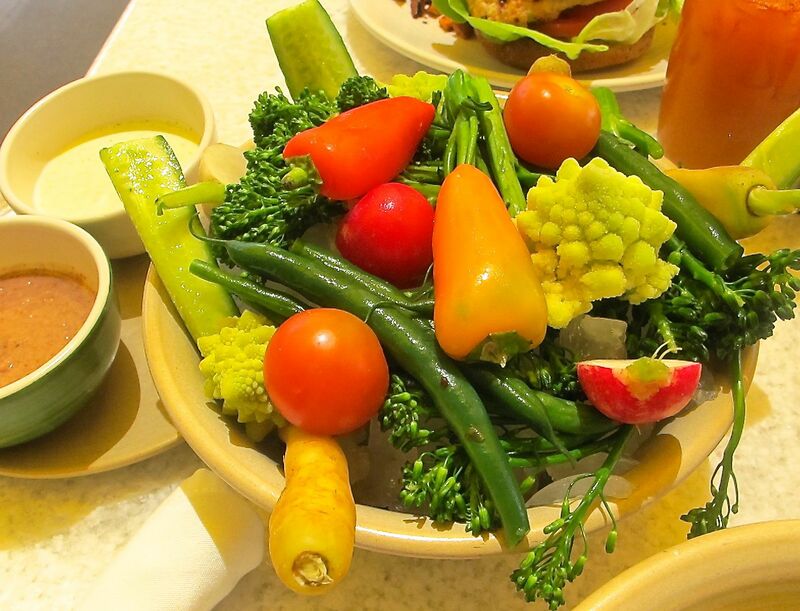 As you walk into this bright, airy restaurant you are greeted with the fragrance of fresh fruits and vegetables and the staff juicing fresh drinks with a variety of combinations. It was difficult to decide between the various juice drinks, but we chose the Pomegranate Limeade (lime juice, Pomegranate juice and Chia seed) and Kale-aid (kale, apple, cucumber, celery, lemon and ginger). Fresh vegetable and fruit drinks were to be the theme of this road trip, at least for breakfast and lunch. We chose to dine outside on the patio and all the diners near us seemed to have a vegetable crudite bowl, it looked so appetizing. 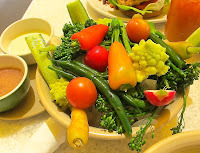 A bowl with a variety of fresh, raw vegetables chilled on ice and a couple of dips served along side. The dips were a black olive, like a tapenade and a Tzatziki sauce, that were both good. 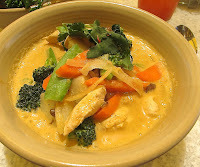 To round out lunch we had the Panang Curry, which was a bowl of brown rice, broccoli, ginger, carrot and mushroom in a coconut broth and added chicken. 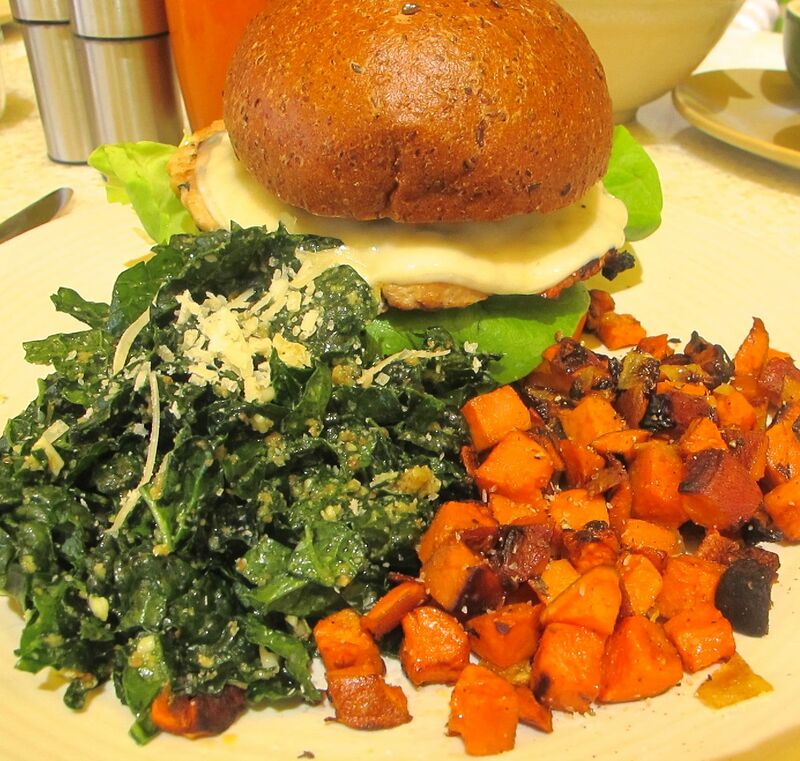 A turkey burger with Provolone cheese, lettuce, tomato, avocado on a flax seed bun, served with sweet potato home fries and kale. Everything on the menu is marked as Gluten Free, Vegan, or Vegetarian which is very helpful with different dietary needs. The verdict on True Food Kitchen: We loved it and will return in the future. It was our favorite restaurant on this road trip. We both hope to see more restaurants like this in the future.